I explain about the total eclipse in northern Queensland, and how the plane is probably full of astronomy nerds like me. Of course there are the ones who chase every eclipse, but there's also a contingent who has seen the crappy hand nature is dealing us this decade and decided Australia is the best chance we'll get. And what a crappy hand it is! What you quickly learn from eclipse travel is that most of the Earth is remote, and the parts that aren't remote are cloudy. A total eclipse happens somewhere every one or two years, but the spectacle is limited to a narrow strip of land rarely more than a hundred miles across. The Moon's shadow crosses the earth like a reverse searchlight, skipping along for thousands of miles from sunrise to sunset ①. The eclipse in any one spot lasts for only a couple of minutes ②, and that is only if you can get within a few miles of the centerline, which mother nature has selected with perverse disregard for our convenience. The total eclipse of 2010 was almost comically unreachable, visible only from wallet-obliterating Easter Island, or else as a sunset blip from extreme southern South America. There was no total eclipse in 2011. In 2013, the moon's shadow will cross equatorial Africa, right through the thunderstorm factory known as the Intertropical Convergence Zone. Most of the eclipse track traverses country that is expensive to reach and has few or no roads. In 2015, whatever tiny tourist industry exists in the the Faroe Islands is going to be steamrollered by people willing to pay a fortune to see what stratus clouds look like in the dark. The theme of the almost wilfully pelagic 2016 eclipse is "Expensive Cruise or Borneo?" And then finally in 2017 there is relief in the form of an all-American, Republican eclipse crossing most of America's red states. And for those of us who can't wait, there is the total eclipse of November 13, 2012, in northern Australia. The destination is remote, and since the eclipse is happening in the tropics on the cusp of monsoon season, the chances for clear skies are poor. But it is the best of a bad bunch, and the consolation prizes are frankly incredible: kangaroos, cassowaries, the Coral Sea, and the Great Barrier Reef. The in-flight map on Air New Zealand is lovely (like everything on that magical airline) but it poses a design challenge. How do you keep a featureless blue square fresh and interesting for fourteen hours? If I have failed to truly appreciate the size of the Pacific Ocean before starting this trip, the error has been corrected by the time we finish the six hour hop over 'the Ditch' from Auckland to Cairns. If you look at a map of the eastern half of Australia, far northern Queensland is the pointy part that sticks out like a spike on a Prussian helmet. The top half of the spike (the Cape York penninsula) is very remote rain forest, but the bottom half down is full of hotels, resorts, sugar cane plantations, and sleepy inland towns. This is Australia's Florida. You come here in the winter when you want to sit on the beach, or when you're in college and the idea of drinking in a room you've rented with fourteen other students is still fresh and appealing. The eclipse will actually start to the west, in a part of Australia called the 'Top End', then cross the Gulf of Carpentaria, traverse Queensland, and head off to sea to entertain rich people. An absolutely exhaustive review of the local climate, prevailing winds, topography and cloud dynamics has reached the conclusion that it is probably a good idea to just go sit on the beach. So I have placed my bets on Port Douglas, a resorty town close to the centerline. Given how far I've traveled, the journey to Australia is surprisingly comfortable. Cairns is a small, tropical airport, and the little minivan takes me sixty kilometers to Port Douglas along a postcard drive. The nice people at my vacation rental have set out two pairs of eclipse glasses and a special edition of the Port Douglas gazette, with a commemorative sixteen-page eclipse supplement folded in among the regular articles about council by-laws and crocodile safety. Some sixty thousand people are converging on northern Queensland for the event. As this is normally the off season, the tourist sector is not worried at all about handling this large influx of visitors. In fact, it would be fair to describe the tourist sector as rubbing its hands. But there is perfidy afoot! There have been several reports on television and in the international press about hotel rooms being sold out in Port Douglas, even though I still see vacancy signs all around town. This kind of wet work, I will hear from several people, can only be the work of neighboring Cairns, a town as far removed from basic Australian values of fair play as it is from the eclipse centerline. 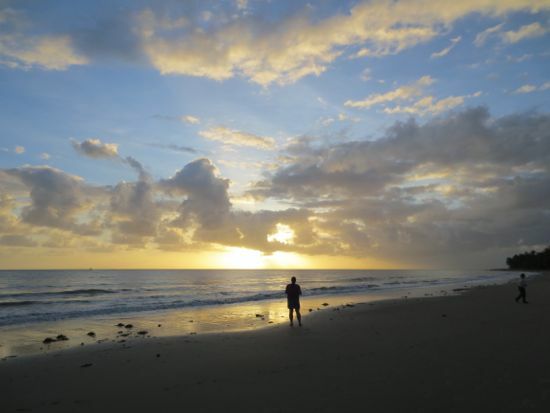 Cairns will stop at nothing in its efforts to steal tourists and Port Douglas, shackled as it is by profound decency and kindness, can do nothing. There are some real shortages, too. All the rental cars in the region have been booked (strangely enough, many of them just for the day of the eclipse, the one time you don't want to be anywhere near a car). And booking a flight at the last minute is almost impossible. It takes more than an eclipse, or spring break, or holiday, or any kind of completely predictable spike in tourism, for Qantas to adjust its Queensland schedule. The radio tells a sad story of a local worthy who has won an eco-sustainability award but is unable to fly to Brisbane to collect it, for want of a plane. I get up early to watch the sunrise, partly because jet lag makes it easy, partly because I want to see what conditions might be like tomorrow, and mostly from my irrational fear that every one of us has done the date math wrong. The eclipse is marked on November 13 in my date book, and while I believe in the International Date Line, I don't believe in it enough to sleep in. I take a short walk down to the beach, where the sun is rising into a belt of clouds on the horizon. Port Douglas is at 16 degrees latitude, closer to the equator than I've ever been, and the ocean here is one giant heat engine, converting sunlight and humidity into cumulus clouds and sadness. The conveyor belt of tenacious little puffy clouds starts forming at dawn at low altitude and churns through the rest of the day. The little clouds move fast, so it's hard to tell even half an hour ahead of time whether the sun will be visible. But they are awfully numerous. Despite the early hour, I see many people on the beach reconnoitering. Some fellows are setting up a tripod, others are just standing and squinting at the sunrise. A nice thing about Port Douglas is that the view is very democratic. The best vantage will be from aptly-named Four Mile Beach, which faces due east. Like all Australian beaches, and despite the efforts of the Sheraton to stake out a wide claim along its property, it is open to the public. No one is going to have to fight anyone for a spot. The cloud has thickened into overcast. If the eclipse had been today, it would have been rained out. I get on my bike and go to my happy place, the Port Douglas Wildlife Park, where Cassie the cassowary is about to have her breakfast. The wildlife park is a large enclosure run by worthy conservationists, and the less carnivorous animals in it roam free. The place is a reminder that depite the suburban surroundings, this really is Australia. Like all sane creatures in Queensland, the animals take naps in the worst of the midday heat, but at opening hours everyone is active and squawking or hopping along, in search of treats. I purchase, for a princely sum, a crappy little alarm clock. The price is absurd until I remind myself that I'm not buying a timepiece, but eclipse insurance. This is about the time when the region was supposed to be shutting down. Based on the press coverage, I expected fires on the horizon and crying children in the streets. Instead, it's quiet and peaceful outside, except for the squawking of the pseudo-chicken, a ridiculous ground fowl that runs through backyards on its big red feet crying "ca-caw!" late into the night. I have set two alarms, arranged for a wake up call, and have been waking anyway every hour out of excitement. It helps that I need to run the air conditioner, and I'm even grateful for the raspy squawking of that pseudo-chicken. Anything to keep me from having the most humiliating eclipse story I can imagine. Figuring I've taken enough chances with sleep, I get out of bed. Outside it's sticky hot and completely black except for the streetlights. There's an impressive infinity of stars overhead, which encourages me. I cross through a little wood, feeling grateful for the moonlight that is making it easier to see where I'm going. Then my mind spins for a while and I realize that this can't be moonlight, not unless I've made a really huge mistake, and looking up I see that the glow is coming instead from thick clouds to the south, over Cairns. The eastern horizon still looks fairly clear. That means nothing, because clouds here can develop so quickly. But we are creatures of hope. On the beach, the most prominent sight is a glowing cruise ship perched just off shore, lit up like a chandelier. it looks unearthly and regal, like it has descended from heaven. Daylight will reveal that this is possibly the gayest vessel to ever ply the ocean sea, the word AUSTRALIA festooned across its side in giant rainbow balloon letters, but right now it shines with quiet dignity. On the beach, some doofus is shining his flashlight around, dazzling people. I can see isolated silhouettes, and about three dark objects that can only be a lurking salt-water crocodile. The ground fowl have concluded their performance. Now the more twittery morning birds are at it. The sky to the east is becoming a pretty shade of lavender, and the sky above is has gone dark blue, with only the bright stars remaining. I am grateful that M J Minnaert has already done the scutwork of describing the minute-by-minute color changes of a sunrise. A number of people are arriving and getting set up on the beach. I am not normally a member of the cult of the marine tropical sunrise. I think things happen too fast in the tropics, and often times the main event is just a big orange ball popping up and trying to give you cancer. I like sunrise at high latitudes, from a skyscraper or mountaintop, when you can watch the thing drag itself above the horizon and think your thoughts. But it's hard to look away from what's happening now on the eastern horizon. The sky is getting bright and orange, with silhouettes of clouds. Clear sky is beating clouds, but not by much. Now it will be a bit of a race between the sun and the moon. The test will be how much damp air the newly risen sun can churn up as it hits its stride, versus how much of a cooling effect the moon will have as it starts to cover its partner. The beach is full of joggers and dogs, in addition to the growing contingent of spectators, and the mood is a kind of festive anxiety. I am pleased to see that Australians consider 5:30 AM a perfectly decent time to start drinking beer. I run into my hosts setting up chairs, but I'm too excited to sit still and will spend the rest of the eclipse pacing. The sun is up and burning everyone. Nobody minds today. Just stay visible, is all we ask. It's going to be close. The sun has gone behind a big cloud and is radiating out angelic rays, which we can trace back to see where it's hiding. It looks like the sun might rise above the clouds in time, but there's also lots of overcast building up in the south (Cairns!) and the wind is blowing all this mess northwards towards the beach. The suspense is awful! Looking the four-mile length of the beach, I can see spots of sunlight that open up and then disappear again over the course of a minute. Most of the time, we are in the shade. When the sun does peer out, we can see through the eclipse glasses that it's had a big bite taken out of it. The cloud is still blocking our view, and the light has become noticeably dimmer. The light is fading fast! Some intrepid soul is flying over the clouds in an ultralight. Things happen quickly. The photos capture what it looks like to see the sun turn into a crescent and then wink out. What they don't capture is that feeling of the world fading out just as if someone were turning a dimmer switch. It's darker and cooler than sunset, even though the relative colors are those of a bright, sunny day. The effect hits a big red button in the reptile brain, saying 'something is not right'. The closest I can remember to it is those summer storms in Illinois where it would get really dark in a matter of seconds, and you knew you had best go hide under something sturdy. Totality! And we can see it! The beach goes completely dark, except for hundreds of flashbulbs from fools who have forgotten to set their camera correctly. I fumble to get a picture, and my flash goes off. The sun has tricked us all! It was behind a very thin cloud at the end, but so dim that it looked like it was blocked out. Now it's clearly visible, a dark hole punched in the sky, surrounded by the corona. I don't have the equipment for a precise reading, but I estimate the metalness of the eclipse at 2.4 megaslayers. I am getting good value for my eclipse-viewing dollar. The beach is whooping and hollering, looking at the apparition in the sky. The cruise ship is lit up like a chandelier again, and all around the horizon you can see the red and orange sunset colors, where the sunlight from a hundred kilometers away is filtering through to us. Up in the sky the planets and brightest stars are visible, but no one can look at that since we're all riveted by the sight of the ridiculous, over the top, airbrushed-on-the-side-of-a-van thing hanging in the sky where the sun used to be. I am thankful I have not taken any drugs. A single dot of sunlight emerges through some lunar crevice, and for an instant it's reflected in the ocean, like a distant lighthouse at night. An instant later it's too bright to look at, and then daylight starts coming slowly back again. I notice that high tide has snuck up on all of us in the past hour and is menacing our feet. The mood on the beach is as jolly as I've ever seen people before seven in the morning. My guess is that half the crowd is from the region, and half are visitors, but everybody is glad they came out, and that the clouds didn't steal the eclipse from us. I am happy that the timing of the eclipse gave everyone in Port Douglas the chance to come see it, not just us tourists. I stop to take a photo of an adorable basset hound sitting on the beach. He's having none of it. First the very sun was plucked from the sky, and now someone is up in his grill. It's too much. He goes over the edge and enters a barking frenzy. Everyone is walking from the beach back to their homes and cars. The eclipse won't technically end for another few minutes, until the moon has completely moved off the sun's face, but for us it's all over. On the drive-time radio show in Port Douglas, Australia, the host promises to bring on an astrologer to talk about “what the eclipse means for your life”. But for me that's the opposite of what makes it wonderful. The eclipse doesn't even know you exist. Nature provides a brief alignment of the Moon and Sun that is completely foreordained, immutable, and will happen with Swiss precision for another billion or so years, whether or not anyone is looking. It is on us to aggregate into litttle bubbles of protoplasm, develop eyes, emerge onto land, discover fire, evolve language, ask the brainier among us where the thing will happen, and make the appropriate travel arrangements. A good way to feel small is to look at the Wikipedia list of future solar eclipses, and think about that fact that between one and another of them you are going to disappear, but the eclipses will keep happening, about one a year, until the moon finally drifts too far away from the earth to perform the magic trick anymore. It's the greatest thing that happens in the sky. Find one on the list you can go see, and see it! ① Exercise for the reader: explain why an eclipse must always start at sunrise and end at sunset. ② The longest a total eclipse can last is 7'31". But it's going to be over a hundred years before the next seven-minute eclipse. ③ I had hobbled across the world on an injured foot to see the 2009 eclipse, traveling with my friend Brendan O'Kane to a mountain resort built by the Europeans in colonial days for when Shanghai summers got unendurable. The resort, Moganshan, is couple of hours inland from Shanghai, a complex of old stone buildings set in an upland bamboo forest, and at the time it included a terrific cafe run by a half-assimilated Brit ④ who had been attempting to make his life there. The day of the eclipse dawned overcast, like we feared it would, although here and there were thinner patches of cloud that momentarily showed the disk of the sun. There were other Europeans staying in the hotel with us, including two French couples with serious eclipse fever. The men had brought crates of photographic equipment numerous enough to put on a decent summer theater production, and giant lenses like barrels. Like all true connoisseurs, their passion for eclipse chasing had seared away any traces of actual enjoyment, and the mood was grim as they decided whether to chance it on the stone patio, or drive somewhere in search of a gap in the clouds. Their wives had the quiet and tight-faced look of women who are earning triple-overtime relationship points. The rest of us stayed put, eating incongruous but tasty English breakfasts under the cloud cover. For me it was an easy choice - the only thing that seemed worse than getting rained out of an eclipse while on crutches was being stuck in a car on a Chinese mountain road while it happened. Meanwhile, tripods were going up all around me. The urge to photograph a total eclipse, the one thing you know with moral certainty that professionals will be taking and sharing far better pictures of than you, is as profound as it is illogical. The sun teased us a few times, appearing as a white disk with a bite cut out of it through the veil of stratus clouds, but they never cleared. In fact, just for laughs, the fog came in. Then right on cue it got dark, rapidly and utterly dark, as if some large object were interposing itself between the clouds and the sun. It felt like the onset of the worst and darkest thunderstorm of your life. Then for four minutes it was nighttime. Cars below were honking (I wondered if any of the drivers had been taken by surprise). The lanky fourteen-year-old Chinese kid who had been sitting on the nearby wall took out his guitar and started playing a soft rock instrumental. We all toasted each other in the dark. And then the light came back up, and it was over. ④ I later learned that the Brit, Mark Kitto, was a pretty famous guy. Earlier this year, after years of frustration, he published a heartfelt and thoughtful rant about why it was no longer possible for him to work in China. Having kept the cafe's business card in my wallet for three years in hopes of going back to Moganshan, I was sad to read it, though I found his reasons convincing. ⑤ The place is called Queensland, but how long could Queen Elizabeth survive if you dropped her here, naked and alone? I'm guessing no more than four hours.